Mostly, Word works well. I’ve used it for many years and been pretty happy with it. But ever since I first started using it, there has been this one thing that has driven me nuts until I learned how to fix it. What happens is this. I’ll be typing along in MS Word, everything seems to be working fine, no problem. Then I decide I need to have some kind of small divider in between a couple of paragraphs. Nothing big, just a few dashes to separate those paragraphs. So I hit Enter to go to a new line, and I hit the old “hyphen” key 3 or 4 times, and I hit Enter again to start the next paragraph. But when I look up and see what’s on the screen, what is there is definitely NOT what I typed. Instead of the 4 “dashes” to separate those two paragraphs, there’s a solid line all the way across the document – from the left margin to the right margin. How in the world did that happen?? I know for sure I didn’t type it that way (you don’t plan to type the hyphen key 3 or 4 times and “accidentally” hit it 50 times!). In order to understand how to get rid of that thing, you have to know what Word thinks it is: a border. I know, it doesn’t really make any sense. But that’s the way it is. We just have to work around it. 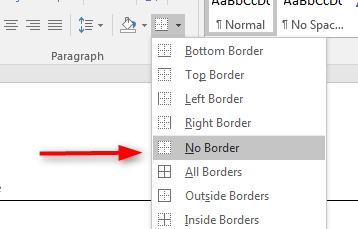 When you choose “No borders” that line disappears. 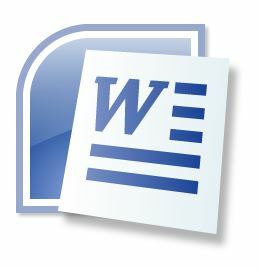 So your problem is solved – but only for this specific Word document. Next time you type those 3 dashes on a line again, the same thing is going to happen. Chances are you don’t really want to have this happening all the time. The steps I just listed above are based on Word 2016. If you have a previous version, your steps might be somewhat different, but if you can at least get to the “AutoCorrect” options you should be able to figure it out from there. 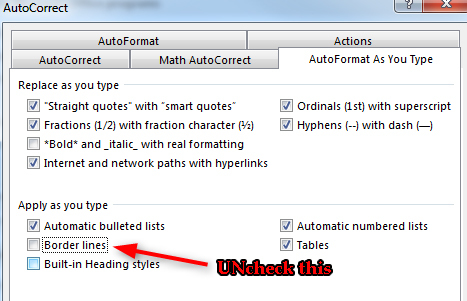 What’s kind of ironic is that Word sets it up to do that document-wide line by default, and has done it that way for years. The idea is that it’s trying to predict what you want and be helpful by providing it immediately and saving you time. The irony is that this “time saver” that’s built into Word has been an annoyance for a very long time for lots of people, and you end up wasting time just trying to figure out how to fix it. Now you know how! After the line appears, I hit Control – Z, and the line disappears. Scott, great post. THANK YOU SO MUCH! !